Have you ever felt inspired to build a working model? In the NZ Treasury building there is a old water-powered model of the NZ economy that was used to predict the effect of interventions. Some might need to know that ROT is rotenone, a herbicide used as an experimental Complex 1 inhibitor, and not a normal substrate. We used to use rotenone as a demodectic mange treatment! The flavin superoxide site is probably N-1a FeS cluster too, but still, not a bad image. There are some quite nifty ETC animations out there but they tend to be restrictive as to their scope. Anyway, I have been re-reading your w3 post which was very thought provoking. I hate to post anything as I really don't have anything of value to add but my "Don't post anything rule" is totally negated by alcohol, well we all have a weakness don't we? I've lost and kept off 50lbs of flab over the last 6 years. I'm 50 years old next birthday and am the nearest to a six-pack as I've ever been in my life. So what? if we parse Peter's biochemistry speculation info from the practical what is the optimal diet info, what do we get? If I'm a fatty (IR or not) with lots of peripheral adipose PUFA to dispose of what is optimal for me to "comfortably" lose weight, ie without hunger/hypoglycaemia? Is this the real modern dietary paradigm? managing the loss of stored PUFA so that optimal protein/fat/CHO ratio and composition can be permanently established? Without carbs I've needed significant (120g/d) protein to prevent hypo's, now not so much. I continue to eat SFA's, minimise carbs/PUFA's and things just seem to get better/easier as time goes on. Maybe the "publically endorsed" processes of fat loss need to address and manage the "stored PUFA problem" independently? O Numnos, high protein seems to be something that accelerates PUFA burning. At least, it changes the pro-obesity effect of omega 6 on a high-carb diet into an anti-obesity effect. Here safflower oil supps are sold as a weightloss pill. I thought this was crazy, but if used while dieting only (protein-sparing diet) they might just work. Even so, I still think it's crazy. George: My poor "Pooh" brain had to read that link a couple of times to make sense of it, as always fascinating stuff. Where I was coming from is that on a PSMF (i.e. zero carb, very low fat) I was having to consume "a lot of" protein to avoid hypo's. In this situation, "dietary fat" is of course stored adipose. My assumption is that due to having swallowed the "low fat/low SFA" Kool-Aid (although to be fair I was an early rejecter of explicit PUFA consumption, something about scraping the bright yellow layer off the top of FLORA margarine got me worried) I ended up with a PUFA rich adipose and that extreme dieting such as a PSMF meant that I was "inappropriately insulin sensitive" in Peter-speak, causing said hypo's (in the absence of sufficient dietary protein). Fat loss was fantastic though (except everyone around me said I looked like sh1t! ), I've seen the photo's, not nice. As time has gone by my protein requirement to avoid hypo's seems to have diminished, I can drink alcohol too without too much trauma, Whoo-hoo! I consume a significant fraction of SFA and look a lot healthier whilst still losing those stubborn fat deposits. I'm guessing there's a point where excess adipose PUFA is flushed out and moderate protein/high (Sat) fat diet/VLC is optimal? (there's still there ? re: ketosis or not, but one step at a time eh?). Is red wine low enough carb for you occasionally? Is there a carb threshold? or the lower the better? Sorry but I still think it is missing an "elephant-in-the-room". I think that the protons on one side of the membrane pair with electrons on the other (or inside the double membrane) forming quasi-particle pairs which then form quantum condensate (Bose-Einstein condensate) acting like one global particle with a much higher energy at its disposal. By "global" I mean non-locality in the QM sense. That's why biochemical reactions are non-stoichiometric and are so temperature-sensitive, as well as are able to overcome high chemical potential thresholds. That's why mitochondria, neurons etc use membranes rather than conducting reactions in the bulk cellullar plasma, except for trivial cases. This kind of follows the pattern - note that the BE condensate can easier form on the 2D or 1D structures such as in HT superconductors without requiring kryogenic temperatures, unlike in 3D volume. I like where Stan is headed. BEC is in play. Interesting thesis as I'm sure the elephant is always there. It is invisible until quantum laws are invoked, whether BEC or the more general effects of quantum tunneling/entanglement. I have some questions regarding ketosis. Bill Lagakos told me you're the man. Please send me an email if you could. Peter has a number of posts on this blog regarding ketosis, what he eats, and the Kwasniewski Optimal Diet (which PD follows, more or less). The idea is adequate protein (varying by activity level from 0.6-1.2g/kg ideal mass) and enough carbohydrate to spare protein (typically around 50g--this is about the amount of glucose you see produced via AAs in non-keto-adapted people in starvation). Fat as the balance of calories. There is some ketosis going on, but it's not at maximal levels. Whoops, I thought bjk = bjtemple, but I suspect that response may work for both of you. I have a 3.5 y/o daughter who is haploinsufficient for NDUFS8, which codes for a significant portion of Complex 1. It was a de novo mutation. We did the testing last year after she received an autism diagnosis. From what we can tell everything stems from the deletion. Luckily she is completely healthy other than cognitive delays. Neither does she have the sensory and behavioral problems seen in "typical" autism. As of yet she does not speak and has basic motor skills. She has always been good with eye contact and is generally a happy girl. The main problem is the significant learning delays. I've read enough to know that ketosis "skips" Complex 1. This I was fortunate enough to know already just from my own hobby research regarding chronic and autoimmune diseases, paleo, etc. We decided to not jump into a KD trial until we gave the neurologists their way for a time. After several blood metabolite tests and a B-50 trial we were advised to stick with that 3x daily. After several months there were no significant improvements. I suspect the improved kinetics are more so intended to prevent any regression. If anyone could provide some confirmation/clarification about the relationship of ketosis and complex 1 that would be much appreciated. If we can indeed "skip" the source of her problems, that is a BFD. One specific question I have is regarding AA blood panels. Do these show the effects of ketosis? If so we could receive verification (proof to clinicians) that it had normalized mitochondria function. Many values were brought to normal ranges with the B-50, but certainly not all. I'll email and we'll chat some more. I think it's probably worth putting up in comments that I don't think life is as simple as "ketones by-pass complex I". In fact they provide almost as much NADH (complex I only) per unit FADH (bypasses complex I) as glucose. They are acetyl CoA precursors, some provide extra NADH cf to acetyl CoA, some don't. So we are not by-passing complex I. FADH is the only route to bypass complex I. Palmitate is a partial by-pass but is not a fuel in the brain. Glycerol-3-dehydrogenase is also an FADH generator, as per the diagram in the post but (I think) G3Pdh probably only becomes active during hyperglycaemia. But what is special about ketones is that they drop the voltage across the inner mitochondrial membrane without compromising ATP generation. They also push chemistry in the cytoplasm to maximise the energy release per ATP molecule hydrolysed. This all goes back to Veech's calculations. 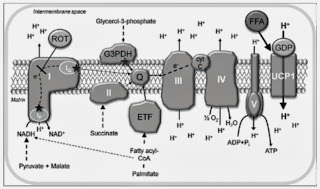 So ketosis provides full ATP energy yield without the need for insulin action (which does need an intact complex I) on the electron transport chain. It is also likely that the low membrane voltage limits free radical production at complex I, which may have a significant delaying effect on neural damage. I just prefer dry white... Threshold will be determined by exercise I think but it is probably also very individual. I don't really do zero carb. But who knows what is ideal? Sigh. Probably need a little more physics. At the moment I view proteins as frameworks for placeing catalytic atoms in to their ideal locations to allow quantum electron transfers. I'm at the tunnel diode level rather than anything global. Of course BHB to AcAc generates an NADH too, which is why the ratio does not improve as much as the succinate input would suggest. But at least SDH is inputting something useful under complex I dysfunction. Wishful thinking or real progress? Most likely a paper tiger..
From Proff Feinman's pinterest, another mito schema showing the general plan of energy routes. No FADH or ETF but a useful map in other ways. bjk, without complex 1 you need another way to turn NADH back to NAD+, ketone body interconversion provides one way, lactate generation is another, there are probably more. In other words, ketone bodies are a buffer against reductive stress, this is probably a significant aspect of neuroprotection. Peter my current blog has lots of physics in it. But the next one due out this week is the must read for you. It ties directly to this picture you posted. You need to understand how the transition metals tie directly to energy transfers in physics and in biology. It is the key that you have been searching for using biologic principles. the answer is easier when you use biophysics to get to it. I have told you many times that you and I working on the same problem but from different ends of the same animal. We are. This is why T2D, metabolic syndrome and Cytochromes and all neurodegenerative disorders are all in play and linked. AL,ZN, Fe, Cu etc........The amount of heme helix in cytochrome one are the reason cytochrome one is the problem. Once you ruin quantum tunneling all hell breaks loose for cell signaling. Remember cell signaling is entirely tied to Ca2+ and calmodulin story which also ties back into the reason transition metals are the key. The epigenetic trigger effects both but the physics is different. Keep up the fight. You are the one shinning star in paleo land. PHYSICS KEY: I went back to my Supernova knowledge of how a star explodes. The core of a dying star becomes an iron/nickel core after it has exhausted all other sources of fuel, and the EMF radiation is simultaneously increased from the star as it dies. This EMF spectrum contains a microwave frequency. In astrophysics they knew how a star blew up, but they never spoke about the detailed mechanism either. I did find out that Nickel releases massive amounts of EMF when it was present in the iron core of a Supernova before it blows up. We learned about this in the 1997-98 from cosmology. I heard about it from a Dr. Greg Aldering, a Cal Berkeley cosmologist. In fact, before a supernova explodes, there is a huge energy spike that is directly tied to the electromagnetic radiation released, and it is tied to the iron/nickel content of the stars core. The energy spike is so striking in astrobiology, that during this short period of time in a star’s life, more energy is produced than our own sun will produce over 4 billion years, at its current output. This amount of energy transfer astounded me. If you fast forward to 22:00 minutes into this youtube video (www.youtube.com/watch?v=9ddgV5dGfwk) you will see this is factual. It also told me that non native EMF on Earth had to have a massive quantum physical effects on the highly conductive transition metals used in proteins. It was here I began to look at the chemistry of these metals. Here the macrocosm of the universe, was showing me what EMF was capable of. I had to see if the macrocosm acted like the microcosm, inside of a living cell. The theory of Relativity scales to cosmologic scales, and QED scales to the atomic and subatomic realm on our inner mitochondrial membrane where quantum tunneling of electron happens and in our pineal gland where melanopsin works in unison with melatonin in the absence of native EMF. In papers written in 1999, it was considered surprising because the electrically conducting metal materials were supposed to reflect microwave radiation and not absorb it, based upon the dogma of the day. This parallels the current misunderstanding of the non thermal EMF effects in our biology today, as well. This parallels the current misunderstanding of the non thermal EMF effects in our biology today, as well. Immediately, I realized if these material scientists did not know about this in 1999, it was clear that no one in biology studied the effect on these metals within a cell, constantly exposed to non native EMF as well. The big problem was, and still remains, the disciplines of material science, astrophysics, and biochemistry just do not cross pollinate in life or in the literature. 16This is why the link, has remained unexplored today. But it does explains why the epidemiology of certain neolithic diseases, like autism, autoimmunity, neuro-degeneration, and cancer all seem to link to various metals which reaction with certain EMF frequencies. Later on, other material science researchers have also demonstrated that all powder metals at room temperature absorb microwaves, and only bulk metals in sheet of bar shape reflect the microwaves allowing only surface penetration. Biology does not use bulk metal sheets in cells. It uses these metal ions in many critical proteins, that are porous, like the metal powders used in industry. However, for relatively coarse particle sizes (>100μm), the heating may be conductive from outside to the interior of the powder. KEY BIOLOGY POINT THE CHEMISTS AND PHYSICS MISSED: All transitional metals used in biology’s proteins are below this size in proteins. In fact, in bone, Robert O. Becker found that copper was the doping mechanism used to bind calcium apatite crystals to bone collagen. This explains the osteoporosis we are seeing on Earth today and it explains why NASA and the Russians can not figure out how to solve space osteoporosis. According to the Faraday’s effect in a conductive material, a varying magnetic field generates an electric field that gives rise to eddy currents and subsequently resistive losses. Hence a metal powder compact or ion cluster in bone or proteins below 100μm in size, will start absorbing more microwave radiation while increasing itself in temperature due to increase in skin depth. For the last 63 years on the Earth, man has created a varying magnetic field in our resonant cavity because of his use of technology gadgets that all use non native EMF. Here is neolithic disease's real epigenetic trigger Peter. T2D happens at cytochrome 1 for a reason Peter. Biology follows natures laws, not biology's beliefs.
" Biology follows natures laws, not biology's beliefs." " Biology follows natures laws, not Kruse's beliefs. " Kruse's beliefs are nature's laws. But you're too biased to see that. Biologic reductionism what is causing that problem. Biology acts by the physical laws of nature. Not by the one's biology says are true. That is where biology got off the tracks. You are entitled to your opinions, but you are not entitled to put words into my mouth that you believe to be true. In principio erat Verbum et Verbum erat apud Krusum et Krusus erat Verbum. "Kruse's beliefs are nature's laws." RETSAT in the upper right hand corner is turning retinol into metabolites that seemingly in adipocytes would promote fat accumulation (via PPAR-gamma) but in the liver increase fat burning (via PPAR-alpha). There may well be more factors out there that will increase fat gain on a high-carb diet but fat loss on a low-carb diet (e.g. linoleate). In Complex II electron tunnels through iron-sulfur protein clusters (PMID: 16780790). The gist of the dietary advice that I'm getting from the dieticians whose opinion I most respect is that the ideal diet depends on your genetic makeup, which you inherit from your ancestors - i.e., a genetic Innuit should eat like a traditional Innuit, a Chinese like his Chinese ancestors, and so on and so forth. I am from Portugal, so presumably I should be eating like the people of the Medietrranean. In this part of the world people don't eat seaweed, even though people eat abundantly from the animals they catch in the Atlantic ocean and the Mediterranean sea. This seems odd to me, considering that we know that Asians have made use of seaweed as an integral part of their diet, and there appears to be growing evidence that it is indeed a healthy, nutritious food to have. I know that before the Industrial Revolution farmers used seaweed as fertilizer for their soils, but there is not example I can think of of a traditional dish that includes seaweed. Surely our ancestors must have tried eating it at some point or another, and yet decided to discontinue it. Wouldn't that indicate that, at least if you are a descendent of Mediterraneans, rather than Asian, you are not genetically adapted to eating it? I am also curious as to why I have never found fish liver served anywhere, or in any traditional Mediterranean recipes. People did use fish liver oil for medicinal purposes, long before the current craze for fish oil as a nutritional suplement began; and fish roe is very much a part of our traditional cuisine (you can find it to this day sold at the fishmonger and in the frozen isles in supermarkets, and of course, there's caviar, famously). But fish liver as is is simply not consumed, unlike the livers of land animals. Could it be one of those cases where our ancestors found through trial and error that the oil of the liver is useful, but that there are counter indications to eating it whole? Much like Asians will eat soy, but not without first processing it in all kinds of ways, namely by fermenting it, thus making it safe and digestible. Wouldn't the fact that in the Mediterranean people don't eat fish liver seem to indicate that it would misinformed to try to eat the innards of a fish (apart from the roe) because we should trust that our ancestors knew better? Paraphrasing the iconic physicist Richard Feynman, there is plenty of room in cellular biology to incorporate model(s) with quantum effects to explain cellular diseased states. As an integral part of a communication circuit utilizing covalent bonds, hydrogen bonds, electronic coupling between donor/acceptor protein "is" the transport system through which electron tunnels and hops. I suspect this is how misfolded protein plays a huge role in causing physical decline.